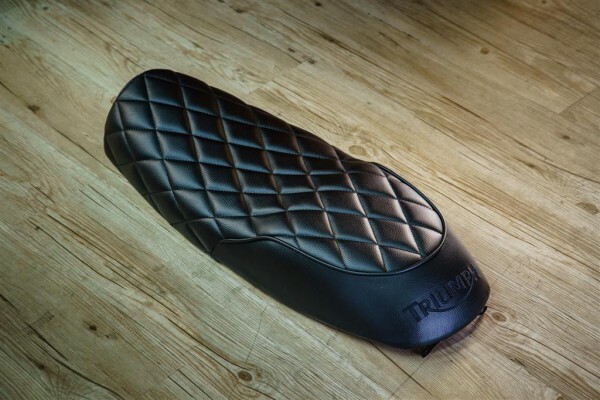 Seat Cambridge black with Logo "Triumph"
Produktinformationen "Seat Cambridge black with Logo "Triumph""
The seat fits 1: 1 on your 2-cylinder Triumph without modification. Fitting to the existing mounting points. High quality smooth artificial leather with embroidered "Triumph" logo. Slim looks, does not go beyond the motorcycle frame like the original seat. Total length 80cm. Weiterführende Links zu "Seat Cambridge black with Logo "Triumph""
Kundenbewertungen für "Seat Cambridge black with Logo "Triumph""
Seat Brighton nubuk black Logo "Triumph"